Born on November 3, 1818, Olive Wheeler was the daughter of Joseph and Olive (Gage) Wheeler of the town of Bethel, Maine. Both families were early residents to Bethel and figured prominently in its development. She was the third of nine children born to the couple. On May 13, 1839 Olive married Almon Grover, also from Bethel, and between them they had 9 children. It appears that the family stayed in Bethel and Almon is listed in the 1850 Census as a farmer. 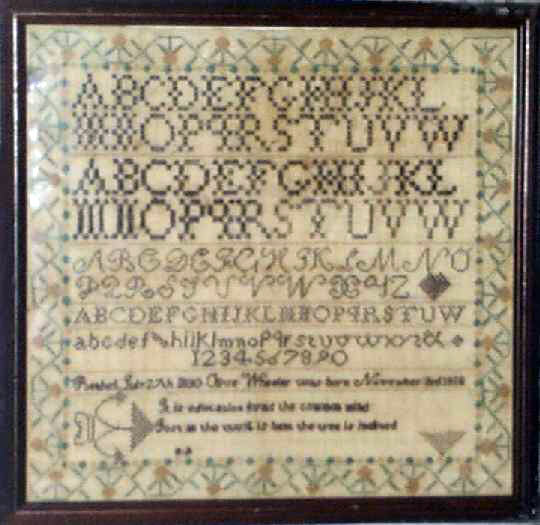 In 1830 Olive worked this fine sampler which names Bethel, Maine . . . an excellent demonstration of her needleworking skills. The wide, undulating strawberry border is further encased with a smaller border of diamonds in green and gold. The borders, alphabets, and verse were accomplished with great control, using a variety of stitches. The various alphabets are separated by shimmering gold whipstitched bands and the monochromatic color palate of black silk is very effective against the light linen ground. We have seen similar presentations such as this from the Academy for young ladies run by the Misses Martin, which flourished in Portland, Maine between 1804 and 1834 and is considered to have been the most prestigious in the state (see Betty Ring, Vol. I Girlhood Embroidery, pp 251-254). The condition is very fine. For some reason the camera is picking up what appears to be uneven color on the ground. The ground is light colored and evenly toned providing a nice contrast with the dark floss. The sampler is framed in a mahogany frame with an ebony bead. Size is 16-1/2" x 17"